The Brisbane City Council has given the green light to a project which will close down a growing Brisbane CBD laneway off Elizabeth Street. A proposal by Melbourne-based Grocon has been approved as of 17/03/2011 after the Brisbane City Council signed off on the project. 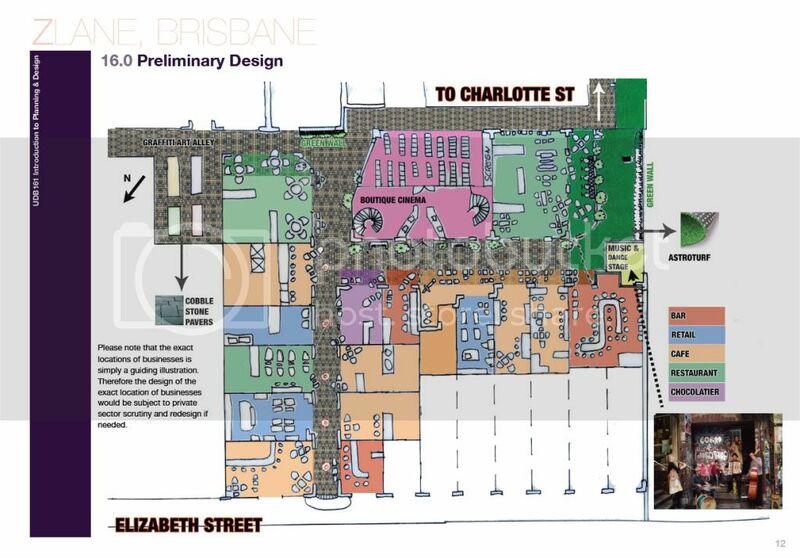 The Elizabeth street development which is being built for the Australian Taxation Office ignored suggestions listed below to redesign the laneway in accordance with the Brisbane City Council’s vision for vibrant laneways in Brisbane. 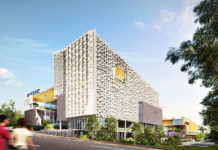 However despite Grocon not amending the original plan to create a more inviting and active urban space, the Brisbane City Council has approved the project which is on a stringent timeline by Grocon and the ATO. The proposed development will mean the demolition of woolstore-style buildings behind the Treasury Row shops which line Elizabeth Street as well as the closure of the laneway itself which will be transformed to vehicle access only. Currently the old buildings behind Treasury Row accomodate a popular coffee shop ‘the coffee supplier’ and a new bar/music lounge called ‘The Alley’. 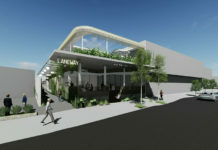 View Mock Retail-Inspired Laneway Design Here. 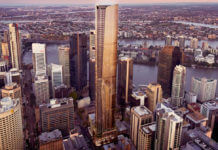 Whilst we are very much pro-development, pro-density and anti-red tape for development, we can see the difference between a well thought out, creative proposal from a rushed, profit driven proposal which this most definitely seems to be, and as Brisbane continutes to grow we need to ensure that there are various ‘human spaces’ to offset our urban highrises and offices. The reality is, there is a laneway here which is growing in popularity and provides Brisbane with an important civic space to hide from the hustle of Brisbane’s main streets. In the past 12 months, we have seen two new venues open up in this laneway, that being The Coffee Supplier and newly opened The Alley which frequently hosts local music talent. These two businesses formed organically, without any council intervention. It was an important step in the evolution of Brisbane’s laneways. The ATO’s stringent requirements should not come before social and cultural spaces in Brisbane. 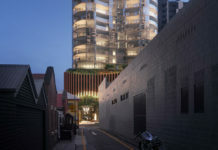 If this tower had been designed to encorporate the laneway concept into the overall masterplan, not only can the developer create more revenue from retail leases, but it will give the ATO – this building’s core tenant additional eateries and rest venues to visit, rather then just a sterile cafeteria that is planned. The strange thing about all this is that this proposal is coming from a prominent Melbourne based developer. One would have thought that coming from the land of laneways, they might have shared the passion that a lot of Brisbaneites now have, who wish to replicate Melbourne’s successful urban laneway recipe in Brisbane. However, as the saying goes, money talks and sadly a very culturally important civic space will be erased from history. Surely we need to change this from occurring again. A campaign to try and save the 1920’s building and the laneway has commenced with the launch of Love our Laneways which can be found on Twitter and Facebook. I can never understand why developers in Brisbane (even if they are from the south) are in such a rush to take away any remnants of older times in Brisbane, which does have a history to share. Obviously those who govern seem detached from providing for grass roots community needs, such as lane-way destinations which make Brisbane more livable… or maybe that’s why Melbourne was voted most livable city in the world by the Economist magazine poll! Wake up governments, there is more to life than transit tunnels and sprawl. I agree, I love Melbourne lane ways and if Brisbane had such lane ways compared to Melbourne it will add more character to the city.